In the previous papers, (Part 1 and Part 2), I provided a mechanism to print WPF lists in the form of a report that supports Headers, Footers, PageHeaders PageFooters and grouping. In this paper, I will expand the previous implementation to look like a real report engine that covers almost 80% of the print requirements except charting and graphing. The story began by posing the problem of printing a ListView in such a way that the printing process takes into account the pagination. Although, WPF has the capability of printing any Visual, however it does nothing about pagination. It means if the visual exceeds one page, the over headed area would be excluded from the printed version. In the first part of this series, I showed an approach for the problem using custom DocumentPaginator. DocumentPaginator provides an abstract base class that supports creation of multiple-page elements from a single document. My custom DocumentPaginator created a ListView per page and then filled it by the ItemsSource of the original ListView until its size reached the end of the page. Filling the next page was started from the end position of the previous ListView. This process repeats until there is no data in the ItemsSource. Interested reader can read the first part of this series for further detail. In the second part of this series, I extended the approach to support grouping of data. The proposed method used the GroupDescription class of the .net framework to define custom groups on the data. The generated groups can have Headers, Footers, PageHeaders and PageFooters. User is able to provide custom footers or headers using DataTemplates. Limiting to one group section is the main restriction of the previous version. The ability to view the reports in a ReportViewer. The ability to define custom layouts for the reports including any number of groups, sub groups and etc.. Simplifying the code by removing code redundancies. The ability to view the reports as XPS documents. The ability to dynamically deploy the reports. Although, the story began by providing a mechanism for printing a ListView, now, it is far more than printing a ListView. We deal with a report engine now, so the first refactoring is renaming PrintableListView to Report. Also there is no reason to inherit the Report from the ListView, instead it should inherit from the more general class, ItemsControl. In the previous implementation, both of the Report and ReportGroup classes have the Header, PageHeader, Footer and PageFooter properties. On the other hand, there was some kind of code redundancy in the previous implementation. The better architecture is having a ReportSection class that contains those properties. The ReportGroup inherits from it and the Report class has an instance of it in its MainSection property. In the previous implementation, the rendering code was distributed in the Report and ReportGroup classes. In the current implementation, there are classes called ListViewSection and ItemsControlSection that are responsible for rendering the main data. The following diagram illustrates the architecture of the new version. In the following section, I elaborate the classes in more detail. This class is the entry point of a report. In the new version, it does not have any special rendering code. All of the layout definition and rendering process has been done in its MainSection property that will be described later. Its PageSize property gets the size of the printed pages in pixels. Each pixel is 1/96 of an inch. Its Document property is new in this version. It contains the output of the rendering process and its type is XPSDocument. ReportViewer uses it to show the report. The instances of this class are the blocking parts of the report. Although the class itself is an abstract class, but there are several concrete implementations of it such as ReportSection, ReportGroup, ListViewSection and ItemsControlSection. Among them ReportSection and ReportGroup are composite classes. By composite class, I mean they have a child property of type Section that is called Body. Composite Sections can be used to cover other sections. Here is the code of the Section class. The Initialize method of the class has been called by the parent section or by the report before generating printed pages. The Render method generates the content of the current page. It puts the generated content of the current page in the CurrentPageBody property of the class. The CurrentPageDataSource contains the data source of the current page. The CurrentPageBody and CurrentPageDataSource have been refreshed after each call of the Render method. The ShrinkData and ShrinkControl methods have been used by the parent sections to reduce the size of the CurrentPageBody. The shrinking process is needed in situations where there is not enough space for adding the footer content. It is happen because the parent section has no idea about adding the footer before rendering its child. Only after rendering the current child section it becomes clear. In such cases, if there is not enough space for the footer, then the size of the child section should be reduced using the Shrink methods. ItemIndex property specifies the index of the current item of the underlying data source. The Render method starts adding the items to the CurrentPageBody from the ItemIndex in each page. IsEof specifies the ending of the underlying data source. The Render method updates IsEof value when it reached the end of the data source. These two concrete implementations of the Section class generate list base contents. Their Render methods create list base contents using the provided data source. ListViewSection generates a ListView per page and ItemsControlSection generates an ItemsControl per page. The real shrinking process has been done in these classes. The ShrinkControl method tries to reduce the size of generated content without removing any data from the content. The ShrinkData method reduces the size of the rendered content by removing some data items from them. The removed data will be used in the next page. Here is the code of ItemsControlSection. The code of ListViewSection is similar. ReportSection and ReportGroup classes are two implementation of the Section class that can have a child section. ReportSection has Header, Footer, PageHeader and PageFooter properties and is useful in situations where one wants to create headers and footers for a simple section like ItemsControlSection. 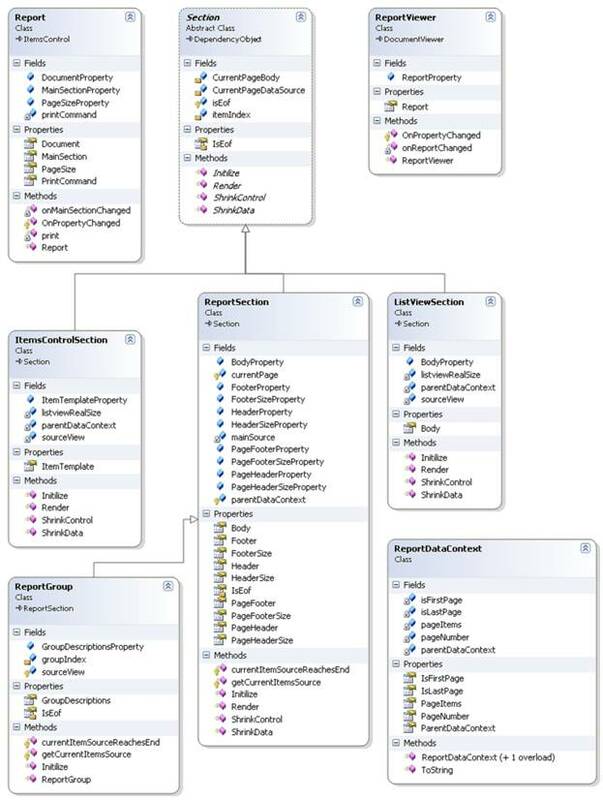 ReportGroup section inherits from a ReportSection and provides grouping functionality for the data source. Grouping of the data in a ReportGroup has been done using grouping feature of the CollectionView class. Here is the code of the classes. Rendering process of the ReprotGroup class is more complicated than other sections. 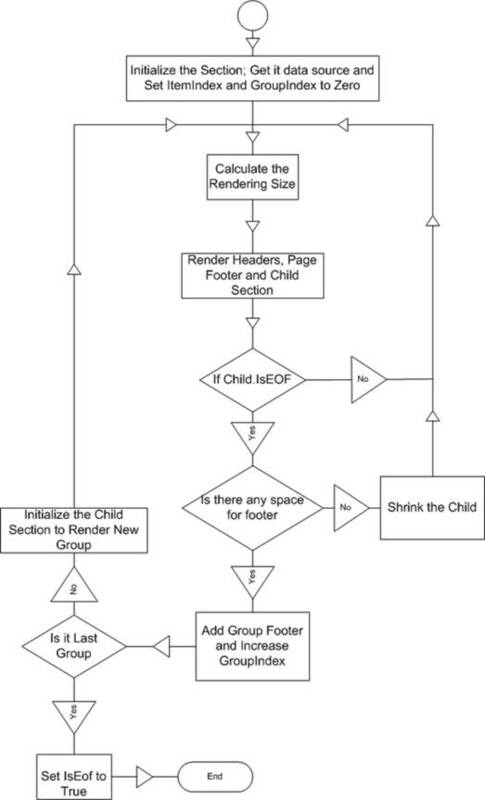 In order to simplify its logic for the reader, I draw the following flowchart that illustrates the process of rendering a ReportGroup class. In this version, there is a simple ReportViewer that is based on the DocumentViewer class of the .Net framework. DocumentViewer Represents a document viewing control that can host paginated FixedDocument content such as an XpsDocument. In order to make our reports consistent with the DocumentViewer, the reports should render their content as XpsDocuments. An XpsDocument contains a FixedDocumentSequence that comprises one or more FixedDocument elements. The following code renders the report as an XpsDocument. Here is the code of the ReportViewer. The attached code contains a simple report that has two ReportGroup section. The first group, groups the data by the Country property and the second group groups the items of each country based on their OwnerName property. Here is the XAML code of the report. In the next paper in this series, I will show the power of the report engine in practical application by providing different report example in different scenarios.